Here’s another foodie giveaway brought to us by Oogave natural products and Wonderful Things In Life . This will start today December 5 until December 20, 2012 and is open for United States only as stated to the sponsors. This Christmas season one of the best gifts to give your loved ones, friends and godchildren is the gift of healthy eating. 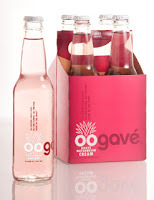 Why not jump-start that by joining this giveaway and winning for yourself 12 mix of natural soda from Oogave Natural Products to share to your family and friends. Joining is easy-peasy, all you have to do is follow all the prompts in the Rafflecopter widget below and you’re all set! This entry was posted in announcement and tagged giveaways on 6.December.2012 by admin.